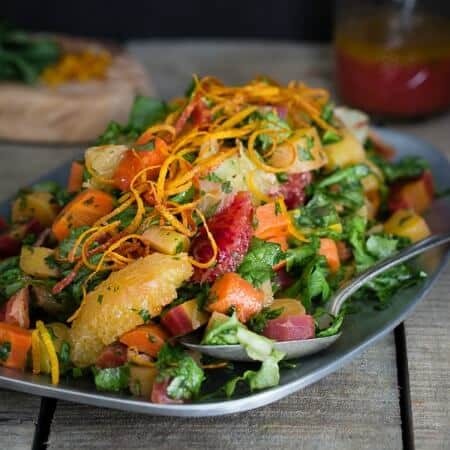 This chopped carrot citrus salad has roasted rainbow carrots, blood oranges and Meyer lemons tossed in a citrus mustard vinaigrette to showcase the best of winter produce. It’s February in two days and as I walking around the grocery store I realized I hadn’t bought a single blood orange all season yet. Moderation not really being in my grocery shopping vocabulary when it comes to fun ingredients, 10 of them went in my cart along with the prettiest pack of organic rainbow carrots for $2. Yes, $2. I think some poor high school employee probably got an earful for that mis-marking. For the past couple of months, I’ve gotten the chance to play around with some Crisp™ kitchen tools. They make a bunch of fruit and vegetable gadgets that make eating healthy fun and the preparation possibilities endless. My absolute favorite though is the 4 in 1 zester. You know those fun zest strips? Yeah, I’ve always wanted to make them but refused to buy a gadget just for that. 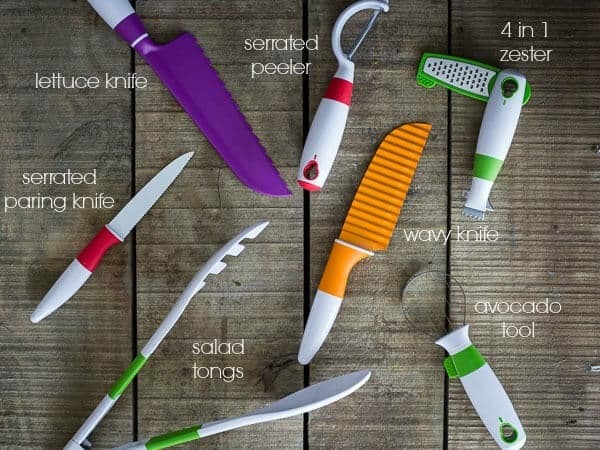 This zester lets you make the strips, the traditional zest and even has a knife blade for scoring citrus so there’s no need for any other zester taking up residence in that packed gadget drawer we all have. I also used the lettuce knife to finely chop some green leaf lettuce for this salad. 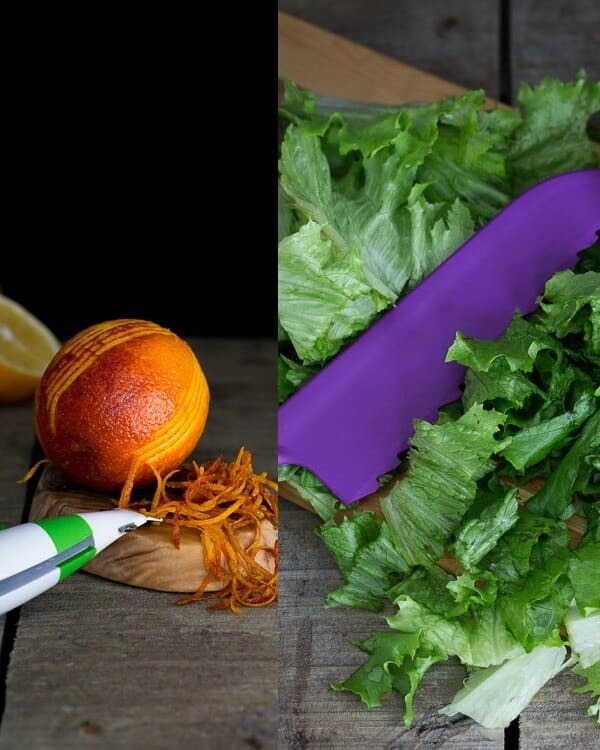 It may be called a lettuce knife but it definitely works on more than just lettuce, I’ve used it on strawberries, mushrooms and a bunch of other greens too. Those two gadgets made assembling this chopped carrot citrus salad a breeze. The sweet flavor of roasted carrots combines with lemon, orange, parsley and mint to make this baby one of the few highlights in an otherwise wasteland of a season when it comes to fresh produce. 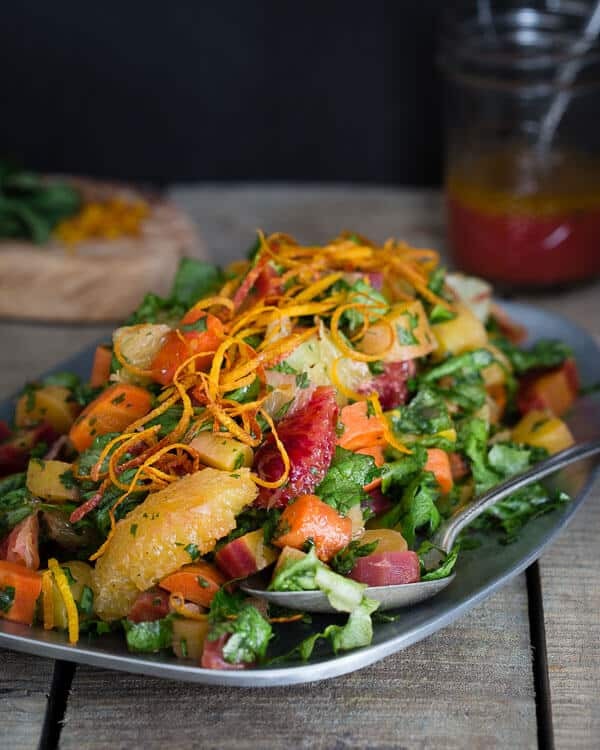 Each bite in this chopped carrot citrus salad is fresh, vibrant and still hearty from the roasted carrots. Crisp makes over 27 kitchen tools but these are some of my favorites I’ve gotten to try out recently. The wavy knife is a super fun way to make restaurant looking potato or vegetable chips and the avocado tool makes quick work of the scooping and slicing mess that usually goes down with those. Line a baking sheet with foil. Add the carrots to the middle of the foil. Drizzle with the olive oil, season with salt and pepper and squeeze the lemon juice on top. Toss to combine then fold the foil and pinch closed. Roast for 20 minutes. Remove from oven, open the foil carefully and set aside to cool. Add the lettuce, orange and lemon segments, parsley and mint to a large bowl. Once carrots have cooled off, add them to the bowl as well. Pour the dressing onto the salad and toss to combine. Plate the salad and garnish with additional orange zest strips. Looking for more great salads to try? Just from looking at the pictures my taste buds start dancing! Great combination of sweet and sour ingredients and I can’t wait to try it myself. What a beautiful salad and great giveaway! I have so much fresh citrus to pick from my yard and this is a great way to enjoy the refreshing flavors! Such a beautiful salad and a really great giveaway! I love that 4-in-1 zester, very cool! Such a gorgeous salad and it’s nice to have the right tools to make it. This salad is so colorful and gorgeous! I want to reach through the screen and eat it! This salad looks so bright and lovely on this cold winters day! Love the beauty of this salad, so pretty and all my favorite ingredients! What a gorgeous salad! I haven’t bought any blood oranges this winter either. I need to get on that, stat! 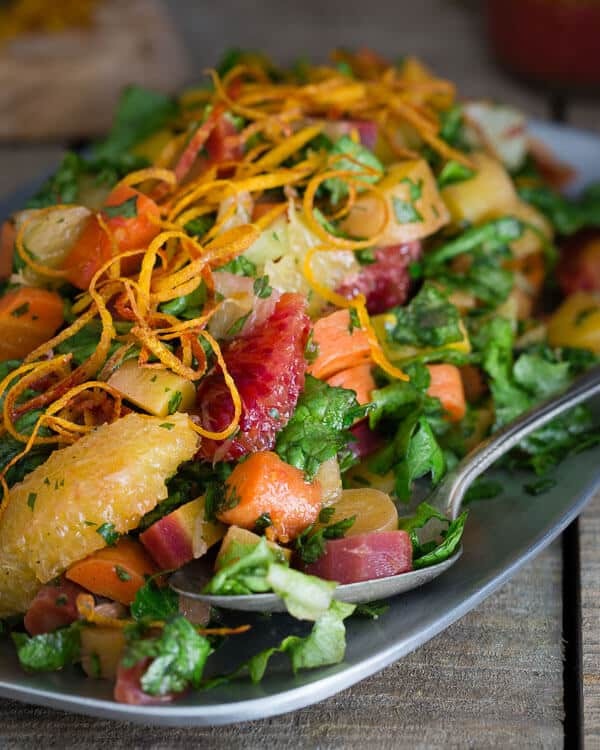 I just love how fresh, vibrant and delicious this chopped carrot and citrus salad is. I often make salads for dinner during the week, so this recipe will definitely will be getting made. Divine! This salad is so gorgeous! And those kitchen tools, I’m lusting!! Could you add chicken to the salad so that it has a protein or would that taste bad? Sure, I don’t think it would taste bad.